Shiitake, Japanese forest mushrooms, are one of the Orient's most exotic, versatile, and delicious foods. 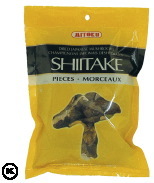 Mitoku Shiitake are cultivated by the natural, traditional method. Hand-harvested at their peak of vitality, they are carefully dried, thus concentrating their exquisite flavor and goodness for year-round use. Truly the world's "Miracle Mushroom," modern science has proven shiitake contains anti-cancer properties. There is strong evidence that higher grades of shiitake are more effective for healing purposes. Scientists now believe an important medicinal substance resides in the spores of shiitake which is the medicinal powder that falls from the under surface of the cap. The most common grades of shiitake are thinner and have open-caps. The highest grade of shiitake are donko, which are thicker and have closed-caps. Sun-dried Donko are the most medicinal variety of donko. The majority of Japanese shiitake and all Mitoku brand shiitake are grown outdoors on natural logs, and no fungicides or pesticides are used at any stage in the process. They are picked early, before the caps open. Mitoku donko shiitake are sun-dried, thus increasing the already abundant vitamin D content of shiitake that are naturally grown outdoors.